How does your garden grow? Emmy-award winning TV personality, author and garden guru Pat Welsh recently visited our South Coast Plaza showroom. Pat has been gardening since the age of three. 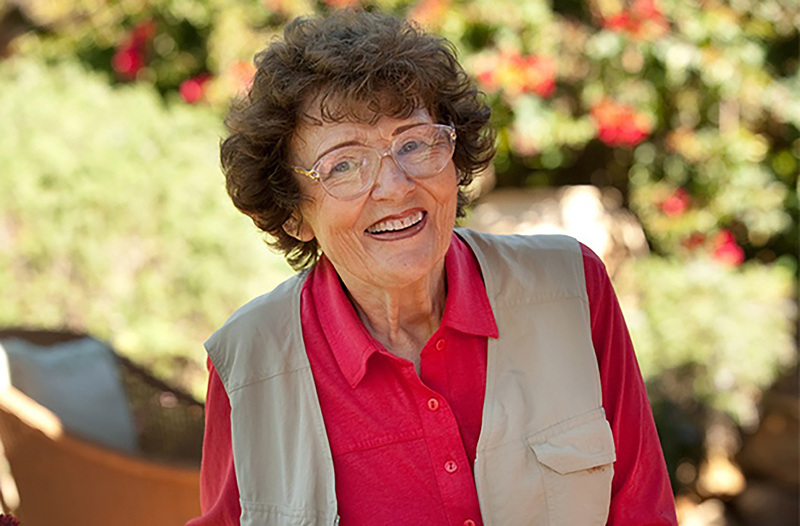 She has spent more than 40 years sharing her unique brand of practical garden know-how. We took the opportunity to ask her for tips on creating a beautiful and useful patio. What one tip would you offer to someone who wants to create an attractive and functional patio? I believe the style of the garden and patio should complement the style of your home. If you live in a “country” or ranch-style home with a shingle roof and white clapboard exterior, a country-style patio decorated with spring flowers, rusted or worn art objects and a mixed palette of comfortable furniture and wooden benches would be harmonious. If your home is more Spanish-inspired, stick with bright colors, furniture and plants like bougainvillea that can pop against white walls. The key to a functional patio is the furniture. Be sure to have dining tables and chairs as well as chaise lounges and side tables for relaxing. What characteristics do the best patio plants share? Some of the best patio plants are clean. Whether it’s a statuesque tree or a climber like monstera, it would provide a sculptural shape but hangs onto its leaves until you cut them off. This is not to say a patio plant like bougainvillea with flowers is not ideal; you just have to commit to sweeping up the dropped petals, but it’s worth it. Alternatively, a plant that provides a long season of color (but is still clean) like hydrangea or camellia is also an excellent choice. Variegated plants or plants with colorful leaves, like breynia or coleus work since their color lasts longer and their leaves hang on all season. Another important factor for patio plants is choosing the correct size for the space you put them in and that they adapt to the exposure and conditions. Some plants thrive best in a narrow bed or tub while others need more traditional pots. What does it mean to “choose a color scheme”? A garden and patio look best when a limited range of colors are used. Just as in a painting, one does not use every color in the rainbow—be selective! When creating a patio, start with a color scheme like spring, sun or south of the border colors. For spring colors, start with red, white and blue, which is the patriotic color scheme that you see all over New England in the summer. Switch the red to pink and add yellow and, if you want, lavender. But don’t add orange because it kills the effect. Sun colors are obviously the colors of sunshine: every shade of red, pink, orange and yellow along with blue and white. For south of the border, think colors that look great with Spanish architecture: bright red, orange, chartreuse, yellow, purple and magenta. You can put orange right next to the purples—clashing colors look great when part of a whole scheme. How do you create a spectacular patio while dealing with the constant climate change? Patios are one of the best and easiest ways to deal with environment issues like drought. Where there’s paving (preferably the kind that’s permeable that allows water to pass through into the ground), you don’t need plants and water. If you need shade, use a pergola or an arbor versus a tree. They do the job with a great deal less irrigation and you could even cover them with a fruitless grape vine or a climbing option like Lady Banks Rose. Finally, use furniture to carry out your color scheme and if drought is a severe issue, bold and bright pieces can take the place of flowers. Plus, you don’t have to water your outdoor furniture!